4. Fallen or Unfallen Nature? Has Satan fabricated some look-alike perversions of the most sacred doctrines in Christianity? Indeed he has, and the delicate distinctions have made even theologians and scholars very reticent to oppose them openly. Many sincere Christians argue that the parallel views are so close together that no issue should be made over them. Others believe that the difference is largely semantic and involves only shades of meaning in the use of the words. Is it possible that our mighty psychological adversary has actually anticipated these predictable human reactions and has skillfully created subtle deviations from the truth that will seldom be recognized and resisted? Indeed I believe he would be foolish not to exploit his six thousand years' expertise in the mind sciences. This is why the path of error lies ever so close to the path of undeniable truth. Satan has gambled that the average Christian will be reluctant to take a stand against something so close to truth, especially if that truth happens to involve the work of the cross, or the spotless life of the Son of God. Who wants to appear to be in opposition to these holy realities? It seems much safer simply to tolerate the deviant position than to risk being misunderstood in attacking the near-perfect counterfeit. I am convinced that Satan has cleverly produced and popularized a disguised error that has led to a network of related errors. And they all circulate around the most sacred subject dear to the heart of a committed Christian—righteousness by faith, the incarnation of Jesus, and victory over sin. There can be no doubt that this series of erroneous views are related to each other by a convincing chain of human logic and reasoning. If one point is true, then all the other points must necessarily be true also. But if one point is in error, the other points lose their credibility as well. It is very likely that the chain was started by the interjection into early church theology of the doctrine of original sin. Beginning with the valid biblical position of man's inherent carnal nature, which predisposes him to sin, the idea gradually evolved that Adam's guilt was also imputed to his descendants. Augustine was responsible more than any other for propagating this view of transmitted guilt. Through Luther and the reformers it found its way into many of the Protestant churches. Although the doctrine created a tremendous controversy in the early church, most modern Christians seem to accept the majority view today without much deep thought or question. It is easy to see there is only a marginal difference between the two views, both then and now. Adam's weakened, sinful nature was passed on to his children through the laws of heredity, making it impossible for them not to sin as long as they remained in an unconverted state. Since their sin was the result of Adam's sin, it was easy for them to slip into the error of believing that they shared his guilt. But there is a very important difference between the inclination to sin and the guilt of sin, and it is that small degree of difference that has triggered a series of other doctrinal errors. Said the prophet, "The son shall not bear the iniquity of the father, neither shall the father bear the iniquity of the son" (Ezekiel 18:20). As a logical outgrowth of believing in original sin, the Catholic Church developed a strong doctrine of infant baptism. Only by their sacrament of sprinkling could the curse of Adam's guilt be removed from the baby. Since the child's salvation hinged upon a proper baptism, absolute priority was assigned to that ritual. If a choice had to be made between the life of the mother and the life of the unborn baby, the mother was sacrificed. Catholic doctors and nurses were instructed in the art of baptizing a fetus in the womb if there was some question about a live birth. The original sin doctrine also gave rise to the dogma of the immaculate conception of Mary. If every baby was born with guilt on its soul, then something would have to be done to preserve Jesus from that guilt—else He could not be a perfect sacrifice for sin. The Catholic solution assigned Mary a miraculous conception also, which preserved her from the effect of original sin. Thus Jesus would be born of a human mother without partaking of the supposed guilt of Adam. As an extended consequence of their view of Jesus as altogether different from man, the Catholic Church also introduced the illegitimate system of human priesthood. If the Son of God did not dwell in man's fallen nature, then the ladder had not been let down from heaven to earth. The gulf still had not been bridged between a holy God and fallen humanity. Therefore, some further means should be provided to complete the connection. First, it was assigned to priests on earth that are known to have sinful flesh. Then, a mediatorial role was claimed for those who had dwelled in sinful flesh but had been canonized by the church as saints in heaven. Finally, angels and the mother of Jesus were accorded intercessory status between man and God. Already we can begin to see the chain reaction consequences of a small deviation from the true doctrine. Now let us look at the effect of original sin on the churches of Protestantism. How could they avoid the dilemma of their belief as it related to the nature of Christ? Although they rejected the Catholic tradition of the Immaculate Conception, they invented a doctrine that was equally un-scriptural and which removed Christ totally from the fallen family of Adam. This view declared that Jesus was incarnated in a special manner that preserved Him from partaking of the nature of Adam's descendants. Instead, He was born with the unfallen nature of Adam and lived His holy life in the uncorrupted state of sinless humanity. Again, we are struck by the marvelous duplicity of the counterfeit. He did come in human nature, they say, but it had to be in Adam's unfallen nature in order to protect Him from the pollution of original sin. Is this a serious digression from truth? Does it make any difference whether we believe He possessed pre-sin humanity or post-sin humanity? Many sincere Christians believe that it is a minor, moot point that carries no significance in practical application. The truth is that this small deviation has laid the groundwork for a series of other false conclusions that strike at some of the most cherished truths of Protestantism. In the first place, such a doctrine is diametrically opposed to the clear teaching of the Bible. At least six times we are assured that Jesus had a human nature exactly like ours. In Hebrews 2:11 we read, "For both he that sanctifieth and they who are sanctified are all of one: for which cause he is not ashamed to call them brethren." Brothers are of one flesh and family nature. Christ is the one who sanctifies, and we are being sanctified; and we are all of one flesh so that He can call us His brothers. This establishes the point beyond any question. "For verily he took not on him the nature of angels; but he took on him the seed of Abraham" (Hebrews 2:16). How could He partake of Abraham's seed if He took on Him the nature of unfallen Adam? The emphasis here is that He did not take on some exotic, sinless nature such as angels or holy Adam might have had but the same nature that Abraham's children possessed. They had sin-weakened bodies and minds. So did He. This does not involve guilt. To be subject to sin is not to be guilty of it. He was tempted in the same way we are, yet He never once yielded to or entertained sin. He never developed any propensities toward sin by giving way to it. He remained undefiled by sin and was always totally pure and holy. "Wherefore in all things it behoved him to be made like unto his brethren, that he might be a merciful and faithful high priest in things pertaining to God" (Hebrews 2:17). Why was He born in the same flesh and nature we have? So that He could be understanding of our weaknesses and inclinations toward sin, and be a merciful High Priest for us. Do the words "in all things" really mean "in all things"? Of course. Paul declared that Jesus "was made of the seed of David according to the flesh" (Romans 1:3). It would be contrary to reason for these words to be interpreted to mean that Christ inherited a holy, unfallen nature from Mary. Whatever David's seed was like after the flesh, our Lord partook of the same. All of those descendants of David, except one, yielded to their hereditary inclinations and committed personal sins. Jesus, like all others, inherited the nature of David after the flesh, but He did not yield to the inherent weaknesses of that nature. Although tempted in all points like we are, He did not respond by a single degree of indulgence to any of those temptations. His life was a constant fortress of invincible spiritual power against the tempter. By relying wholly upon His Father's ever-present strength, He demonstrated the victory that is possible for all of David's seed after the flesh to experience. Again, we read, "Forasmuch then as the children are partakers of flesh and blood, he also himself likewise took part of the same" (Hebrews 2:14). Notice how the inspired writer emphasized the sameness of the body of Christ with man. HE—ALSO—HIMSELF—LIKEWISE. These four words are used consecutively even though they are repetitive and redundant. WHY? In order to impress us that Jesus really did enter into the SAME nature man possessed. Just like children partake of the same flesh and blood, he also himself likewise took the same! How can this unambiguous language confuse anyone? Incidentally, these inspired words definitely tell us that Christ took part of the same nature as the children who "are partakers of flesh and blood." Doesn't this tell us without question the kind of nature Christ possessed? Did Adam have any children born before he sinned? Not a one! The fact is that all the children who have ever been born in the world have inherited the same fallen nature of Adam, because they were all born after Adam sinned. The book of Hebrews declares that Jesus "himself likewise took part of the same." The same what? The same flesh and blood as children inherit from their parents. What kind of flesh do children inherit from their parents? Only sinful flesh. Has any other kind of flesh except sinful flesh ever been known among the descendants of Adam? None whatsoever. If Jesus partook of the same flesh and blood as the children, it had to be sinful flesh and blood. There is no other conclusion to be drawn. Yet, He Himself was sinless! "It would have been an almost infinite humiliation for the Son of God to take man's nature, even when Adam stood in his innocence in Eden. But Jesus accepted humanity when the race had been weakened by four thousand years of sin. Like every child of Adam He accepted the results of the working of the great law of heredity. What these results were is shown in the history of His earthly ancestors. He came with such a heredity to share our sorrows and temptations, and to give us the example of a sinless life." (The Desire of Ages, page 48). This statement described the working of hereditary laws and is in perfect support of Paul's declaration that Jesus partook of the same flesh and blood as children receive from their parents. That is referring to heredity also. If Christ had been born with Adam's unfallen nature, the very suggestion of hereditary influence would be ridiculous in the extreme. There could be no place for any kind of inherited tendencies in a holy Adamic nature that had never known either birth or ancestry. If He had no inherited weaknesses, why would the writer of Hebrews say that He partook of the same flesh and blood that children receive from parents? Certain it is that the Creator did not incorporate any inherent weaknesses into the original creation. Adam had no battles to fight against hereditary tendencies. He had the power in himself to choose always not to sin. Did Jesus as a man claim to have that kind of power? No. He said, "I do nothing of myself; but as my Father hath taught me, I speak these things" (John 8:28). Repeatedly, Christ spoke of being dependent on His Father for what He said and what He did. Does this mean that He possessed no deity and omnipotence as the Son of God? On the contrary, He was truly and wholly divine, just as He was truly and wholly man. But those two natures apparently were not amalgamated into some hybrid personality that stood apart from either God or man. He was fully God and He was fully man. He could draw upon either of these distinct natures while living here in the flesh. But the really important thing for us to remember is that He did not exercise His divine power to save Himself from the weaknesses and temptations inherited from His human ancestry. He chose to live His life here as a man in the same way we have to live it. To save Himself from sin and the perils of the flesh, He depended constantly and solely upon the power of His Father. It was in this way that He overcame the devil, closed every avenue of temptation, and lived a life of perfect obedience. By never yielding to the inherent appeal of the flesh, He set an example of the kind of victory that may come to every child of Adam through dependence on the Father. Satan tempted Jesus in the wilderness to use His divine power to satisfy His agonizing hunger. Satan knew that Jesus had the power of deity to work that miracle. His hope was that he could provoke Christ to draw upon His divinity for relief. Why would that have been such a triumph for Satan? He could have used that to sustain his charges that God required an obedience that no man in the flesh could produce. If Jesus had failed to overcome the tempter in the same nature we have, and by the same means available to us, the devil would have proven that obedience is indeed an impossible requirement. Satan understood very well that Jesus could not use His divine power to save Himself and to save man at the same time. This is what made the test such a severe and agonizing experience for Christ. If Jesus actually inherited the compromised nature of Adam, then why didn't He sin like the rest of Adam's descendants? Because He was filled with the Holy Spirit from the womb and possessed a fully surrendered will and sanctified human nature. May we partake of that same power to keep us from sinning? Yes. Jesus, in living His life of victory over sin, did not utilize His divinity but confined Himself to the same power available to us through conversion and sanctification. Had He not won the victory over Satan in the same nature we have, what encouragement could we draw from His victory? I did not need to be shown that it was possible for Adam not to yield to sin. I already knew that. What I need to know is that I can overcome sin, my nature being what it is. Satan charged God with requiring something that couldn't be done. The reason fallen man could not produce obedience is clearly described in Romans 8:3, 4: "For what the law could not do, in that it was weak through the flesh, God sending his own Son in the likeness of sinful flesh, and for sin, condemned sin in the flesh: That the righteousness of the law might be fulfilled in us, who walk not after the flesh, but after the Spirit." These verses are simplified when we ask a few questions. What could the law not do for us because we were too weak in the flesh to keep it? It could not save us. Because we could not keep it due to the weakness of the flesh, what did God do? He sent Jesus to obey the law perfectly in the flesh. He condemned sin in the flesh by total victory over it. What did His victory in the flesh make possible for us? "That the righteousness (just requirement) of the law might be fulfilled in us." It enabled us to obey. How did His victory in the flesh make it possible for us to obey? By the miracle of conversion, which changes our walk from the flesh to the Spirit. Then Christ in us, through the Spirit, imparts victory over sin to our lives. These obvious truths point up one of the great problems in holding to the pre-fall human nature of Christ. If His victory over Satan, in the flesh, was for the purpose of enabling me to fulfill the requirements of the law, how could His victory help me at all if it was obtained in some other flesh than mine? Here is where this false doctrine strikes at the beautiful principle of righteousness by faith. Righteousness by faith is the imputing and imparting of the results of His sinless life and atoning death. It includes both justification and sanctification. He imputes, or credits, to us the merits of His sinless experience to deliver us from the penalty of sin. This is justification. To deliver us from the power of sin, He does not merely reckon us as righteous, but He actually imparts the strength to overcome sin. In either case, He can only bestow upon us what He attained through His own incarnate experience as the Saviour of the world. Some might claim that since justification only involves an imputing of Christ's sinless record to our account, it could be done in any kind of body. But is that true? The purpose of the incarnation was to redeem fallen man and not sinless man. To do so He had to "condemn sin in the flesh" (Romans 8:3). Our sins that proceed from the flesh had to be condemned by Him, and the only way this could be done was to conquer that sinful flesh and submit it to the death of the cross. Jesus came to take away the sin of the world, as John declared. How could He take away sin that was not even there in the flesh He assumed? To be more precise, how could he "condemn sin in the flesh" in a sinless flesh? Paul said, "I am crucified with Christ" (Galatians 2:20). Why does he further state that we "were baptized into his death" (Romans 6:3)? Every sinner must pass, by faith, through the crucifixion and resurrection experience with Christ. In order to pass from death to life, every one of us must identify with the One who represented us as the second Adam. Our sins were in Him. When He died, we died; and the penalty against our sins was satisfied and exhausted. Can't you see that He had to carry our own fallen nature to that cross in order to make it possible for our sinful nature to be put to death? Anything less would have failed to satisfy the justice of God. Christ had to surrender condemned humanity to the full wages of sin on that cross in order to make atonement possible for us. Otherwise, we could not identify with Him or be crucified with Him. Obviously, redemption requires that Jesus live and die with the nature of fallen man in order to provide the vital link of justification. Now let us look at the requirements of sanctification. Sanctification is not a mere crediting or accounting. It is the imparting of something to us. Just as He imputes justification to deliver us from the guilt of sin, He now imparts sanctification to deliver us from the power of sin. What is the sanctification He imparts? It is our actual participation in the victory of Christ over sin. By faith we enter into and appropriate the strength of the victory He experienced in the flesh. In other words, He is able and willing to live out in us the same overcoming life that He lived as a man on this earth. He will reproduce in us His own sinless experience. This is sanctification. 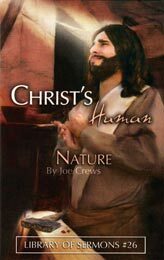 If Jesus came into the world with Adam's unfallen nature in order to manifest a sinless life, how could that unfallen nature be reproduced in me? Participating in Adam’s unfallen experience does not sanctify fallen men. They are sanctified by overcoming sin in their fallen nature through the same power Jesus used in overcoming sin. There is no way for us to participate in the unfallen experience of Adam. If that is the means by which Jesus overcame Satan, there is no way for Him to impart it to me. But if Jesus gained the victory over Satan in the fallen nature of Adam's descendants, then I can participate in it with Him. That kind of victory can be superimposed upon my own life, because it was gained in the same nature I possess. A sinless experience lived in some alien, unfallen nature could not be credited to me, nor could it ever be possessed by me. Fallen nature can never, in this life, be restored to the state of unfallen man. But we may receive the victory over sin that Jesus gained in the flesh as one of us. In this connection it is interesting to study the short-lived history of a group of Christians in Indiana who claimed to have holy flesh. Around the year 1900 a rather large body of conservative church members became obsessed with the idea that Jesus lived His sinless life in the nature of unfallen Adam. Assuming, correctly, that His victorious experience in the flesh could be imparted to every Christian through faith, they began to teach that fallen man could live out the very same untainted life of sinless Adam. This fanatical view led them to believe that they could reproduce the absolute holiness and perfection of unfallen Adam. This is just one well-documented example of the ramifications of this false teaching. what He had to give, and since He had no victory over sin in our fallen nature, He could not share it with us. Therefore, it is impossible to overcome as Christ overcame. Thus, we can see how the beautiful, basic truth of sanctification is downgraded and removed from the experience of righteousness by faith. Already we have seen how the "original sin" error has generated two other perversions; namely, that Jesus had the unfallen nature of Adam, and that sanctification cannot be imparted to man by Jesus. In fact, most proponents of original sin do not even believe it is possible to overcome all sin in this life. They deny the repeated assertions of Scripture that fallen man can actually partake of the divine nature of Christ. Somehow they cannot perceive and accept the heavenly mystery, so often affirmed in the Bible, that Jesus took man's fallen nature upon Him and, yet, was never guilty of sin. To them the inherited guilt of Adam is so pervasive in human nature that it can only be overcome when translation takes place at the coming of Christ. Is it hard for us to believe that Jesus in His humanity could maintain an absolutely pure, sinless mind during His 33 1/2 years in this world? Is it possible for anyone in human flesh, even under the power of God, to reach such a point of victory over sin? The Bible answer is clear: "For though we walk in the flesh, we do not war after the flesh: (For the weapons of our warfare are not carnal, but mighty through God) … Casting down imaginations, and every high thing that exalteth itself against the knowledge of God, and bringing into captivity every thought to the obedience of Christ" (2 Corinthians 10:3–5). This promise is made concerning sinners in the flesh who turn to the delivering power of the gospel. How much more would our blessed Lord, with no acquired propensities for sin, be able to claim His Father's enabling strength to keep from sinning! The Word of God assures us that we may partake of the divine nature of Jesus and have the "mind of Christ." His sinless experience in the flesh is a guarantee that any of us may have the same victory if we will depend upon the Father as He did. This means that in overcoming sin He had no advantage over us. He fought the enemy in the same nature and by the same spiritual weapons that are available to us. If He had any advantage over other men it was simply that His inherent human nature was never further debilitated by personal indulgence in sin. Can we equal the perfect pattern of Jesus' sinless life? No. All of us have degraded human nature further by giving way to the flesh. Not only have we brought the curse of death upon ourselves by breaking God's law, but we have also made ourselves more vulnerable to Satan by cooperating with him. Jesus never responded to a single sinful stimulus, and Satan could find nothing in Him. He lived all His life with the surrendered mind and will of the fully sanctified. He committed no sins to be atoned for. But even though we cannot equal the pattern, we should seek earnestly to reflect that holy life of Jesus as fully as possible. By the grace of God, we may put away every known sin and be perfect in our sphere with no consciousness of cherished wrongdoing. Does that mean we will be boasting about living without sin? On the contrary, the closer we come to Christ, the more we will sense our unworthiness. Those who attain the standard of Christ will be the last ever to recognize it, much less boast of it. Is it important that God have an obedient people at the end of time that He can point to as a vindication of His character? The Bible reveals that the whole cosmic conflict between God and evil can be traced to Satan's original desire to take God's place and rule the universe. It was his program of false accusation that stirred up rebellion in heaven and alienated a third of the angels. Satan misrepresented God's character and charged the Creator with making unreasonable and impossible demands. How could the devil be proven wrong? God had to provide a demonstration that would forever silence the adversary. It was a long, painful demonstration that led the mighty Creator God to step down into a human body of fallen man and, within the limits of that nature, to overcome everything Satan could hurl against Him. Had He utilized any divine power to overcome sin that was not available to others in the flesh, Satan would have used it to bolster his claims that no one could keep God's law. At the cross, Jesus demonstrated to the entire universe that Satan was wrong. He had proven that it was possible, in the flesh, to be obedient through dependence on the Father. The final step of vindication will take place when the character of Christ has been reproduced in that persecuted little remnant that remain faithful through the firestorm of Armageddon and beyond. Long after Satan's knee has bowed to acknowledge the righteousness of God, and eons after he and his followers have tasted the eternal consequences of their sin, the 144,000 will still be bearing witness to the honor and integrity of God's government. As their new song of victory and deliverance is heard by listening angels, unfallen worlds, and the unnumbered multitude of the saints, all will unite in an oratorio of praise, saying, "Blessing, and glory, and wisdom, and thanksgiving, and honour, and power, and might, be unto our God for ever and ever. Amen" (Revelation 7:12). It is easy to understand why that little group who sing the song of Moses and the Lamb will be so signally honored as they stand nearest to God's throne. It is through their experience that God's character will be vindicated at last. In summary, we can see how the ancient error of Adam's imputed guilt has led to a chain of related deceptions. The most significant truths of salvation have been cleverly counterfeited. The humanity of Jesus has been denied, the imparted righteousness of Christ has been challenged, and the possibility of victory over sin has been ridiculed. It is only as we recognize the basic falsehood that we can avoid the perversions that follow. May God give us the wisdom to stand firmly upon the word alone and to reject every doctrine that is not rooted in Him.